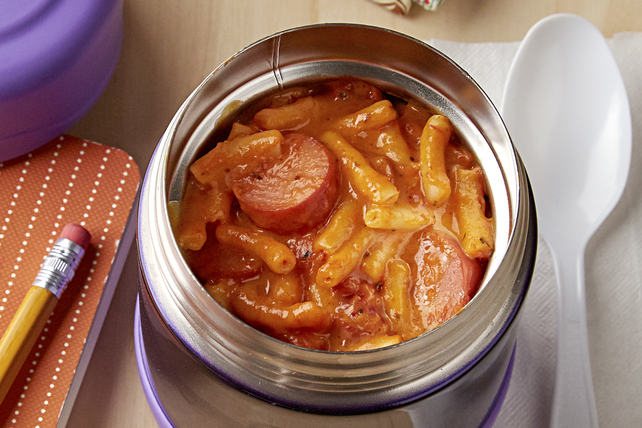 Dig into our hot-diggity-dog Cheesy Hot Dog-Tomato Pasta! Made with just five simple ingredients, this cheesy hot dog pasta recipe is super easy to make. Bring pasta sauce and water to boil in large saucepan. Stir in Macaroni; return to boil. Simmer on medium-low heat 7 to 8 min. or until macaroni is tender, stirring occasionally. Add Cheese Sauce Mix, milk and hot dogs; mix well. Cook on medium heat 1 to 2 min. or until sauce is well blended and hot dogs are heated through, stirring constantly. Serve with assorted cut-up fresh vegetables or fruit to balance out the meal. To keep this pasta dish warm, fill an insulated container with hot water; cover with lid. Let stand 10 min. ; drain. Spoon the hot pasta into the prepared container; cover with lid. Let stand at room temperature until ready to serve.